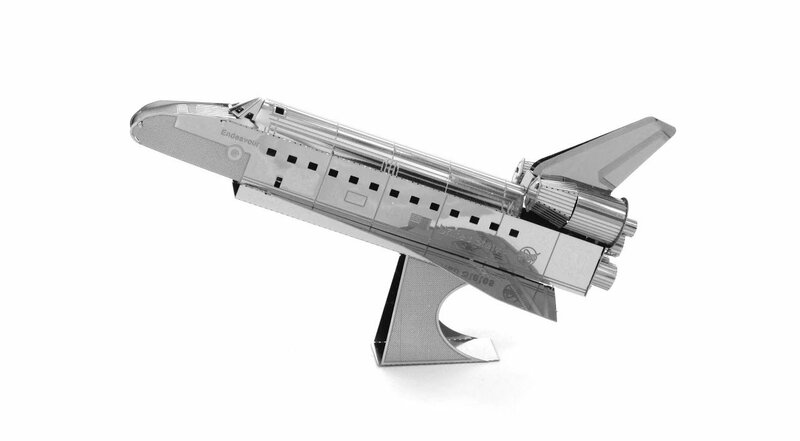 The Metal Earth models are amazingly detailed etched models that are fun andsatisfying to assemble. Each model starts out as 4 inch square metal sheetsand you simply pop out the pieces using wire cutters and follow the includeddirections to assemble your model. The Space Shuttle Atlantis was the fourthshuttle built and the last one to fly. It was launched on its maiden voyageOctober 3rd 1985 and landed for the last time on July 12th 2011 at CapeKennedy. By the end of its last flight Atlantis had orbited the Earth 4,848times traveling nearly 126 million miles. The model is 3.9x2.75x1.95 incheswhen built. Difficulty level: Easy. No glue or solder needed.